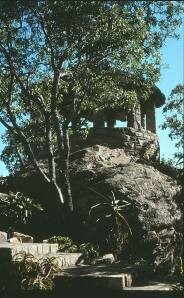 Mabukuwene means ‘the look-out‘ or ‘high point’. 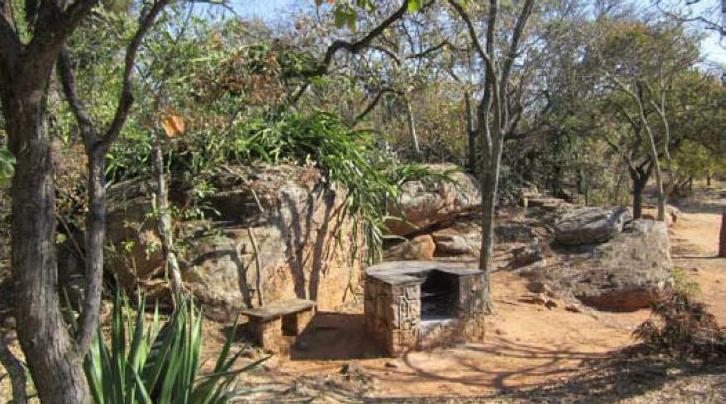 The view point is built upon a rocky outcrop 1 422 m above sea level, and provides a 360 º view of the Bulawayo area from the open-sided thatched rondavel. 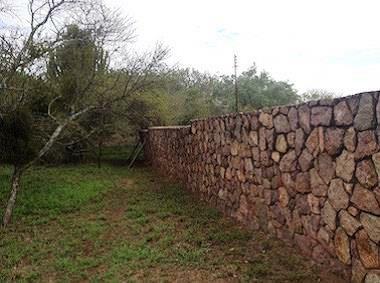 The property is situated a few kilometres south of Bulawayo City-centre and consists of 12 hectares of indigenous trees and plants set in an unspoilt area of kopjes whose distinctive pink hue distinguishes it from other rocky environments in and around Bulawayo. 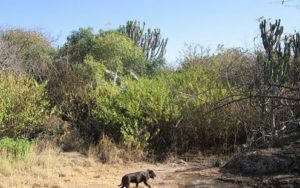 There are some 80 different species of indigenous trees including some particularly fine specimens of Ficus and Euphorbia with many aloes and other succulents. When in flower they attract a wide variety of birds, nearly 100 species of which have been recorded. The property has a long social heritage that extends back from at latest 250,000 years to the early colonial era. This history is represented as archaeological sites, rock paintings, old village remains, graves and various stone and brick-built structures. 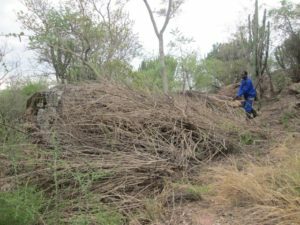 In July 2017 National Museums & Monuments of Zimbabwe conducted a rescue excavation of midden material (ashy village waste and domestic debris) that was being eroded by water channelling down one of the paths. 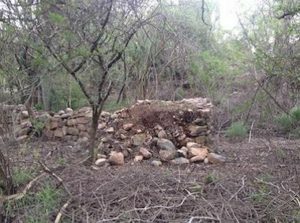 This confirmed that the property was the village of one of the Ndebele indunas (chiefs) in the precolonial era, probably dating to between 1870 and 1890. After colonisation and the alienation of the lands, several adjacent properties were purchased between 1900 and 1926 by Thomas Meikle, one of the country’s leading entrepreneurial families. Thomas Meikle often rode there with his daughters. 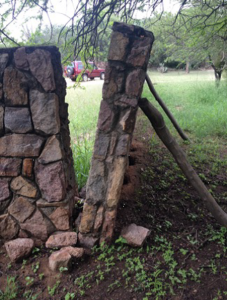 He built the walls around the property, cleared the underbrush, and set the historic wrought-iron gates in the gate posts. 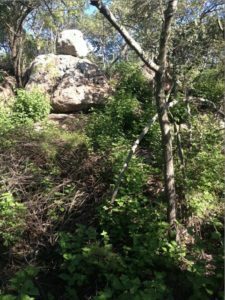 When he died in 1939 he was buried in a gentle sloping granite outcrop under the spreading arm of a giant wild fig tree. The arms of the fig tree throw a chequered pattern of sunlight and shadow on the granite. Members of his family joined him in later years. Other kopies and ranks of bushveld trees ring the area and immediately around there is a paddock of golden grass. 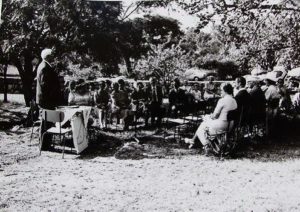 The property was donated to the National Trust of Zimbabwe by the Thomas Meikle Trust in 1979 and partly restored in 1980 by the Aloe Society and the National Trust of Zimbabwe and subsequently the grave area was transferred back to the Meikles Trust in 1995. A small, picturesque thatched hall is available for weddings, lectures and other functions. Various braai stands have been built around the area. 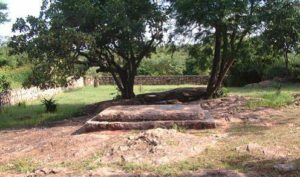 Stand just a few kilometres south of Bulawayo City centre and soak up the atmosphere and imagine the area as it was over 100 years ago, with ox wagons and their teams of oxen outspanned in the dry red dust and now final resting place of some of the country’s earliest settlers. What a rugged life they must have led, in the early days of this great country; travelling north to discover more, crossing rivers, valleys, hills and rocky outcrops in their quest for adventure and a yearning to finally settle in this bountiful land. Stand still awhile and cast your thoughts back in time and remember all the brave souls who adventured forth into unknown territory to found this great nation. Mabukuwene is a lovely place, restful and secluded where a person can sit in the sun, relax and think and enjoy 12 hectares of indigenous trees and plants set in an unspoilt area of kopjes with their distinctive pink hue. Stand on an outcrop and admire the view from 1442 meters (4730 feet) above sea level that affords a 360 º view point of the area. 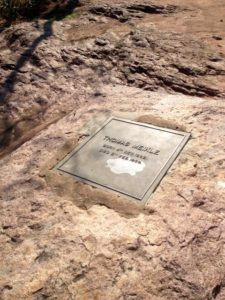 When Thomas Meikle died in 1939 he was buried in a gentle sloping granite outcrop under the spreading arm of a giant wild fig tree. The arms of the fig tree throw a chequered pattern of sunlight and shadow on the granite. Members of his family joined him in later years. 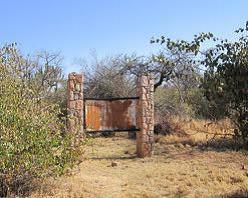 Other kopjies and ranks of bushveld trees ring the area and immediately around there is a paddock of golden grass. Explore the two small areas of gardens, a plantation of jacaranda trees along an originally proposed drive-way, short lengths of dry-stone walling previously dividing the property into paddocks, a roofless ruined house (the barn) and a circular, stone-walled thatched-roofed lookout on the highest rocks. One of the small garden areas is the site of the grave and the other surrounds the house and lookout point in the centre of the property. Discover some 80 different species of indigenous trees including some exceptionally fine specimens of Ficus ficus sonderi and EuphorbIa ingens. When in flower they attract a wide variety of birds typical of the habitat, nearly 100 species have been recorded such as Natal Francolin, Guinea Fowl and Spotted Eagle Owls. Look out for small mammals such as squirrels and dassies scampering around in the bush. 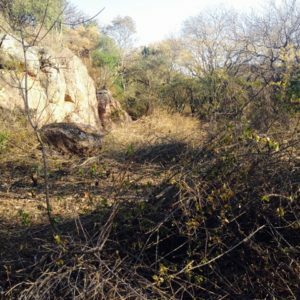 And so the wilderness called Mabukuwene continues, emphasizing the preservation of the indigenous flora and fauna and cultural heritage of the area. Walking, picnicking and enjoying the flora and fauna. Proceed south along Robert Mugabe Way which becomes Hillside Road, pass through Bradfield and Hillside, and look out for Inverleith Drive into which you turn right to reach the entrance to Mabukuwene in Burnside about 5 km from the City Centre. 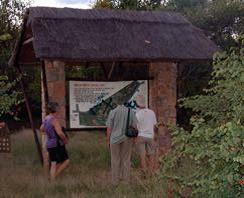 Mabukuwene is open to the public every day except Tuesday. Below is an overview of the problems at the property and the adjacent property owned by the Meikles Trust, progress made and plans for the future for the sustainable management of Mabukuwene. 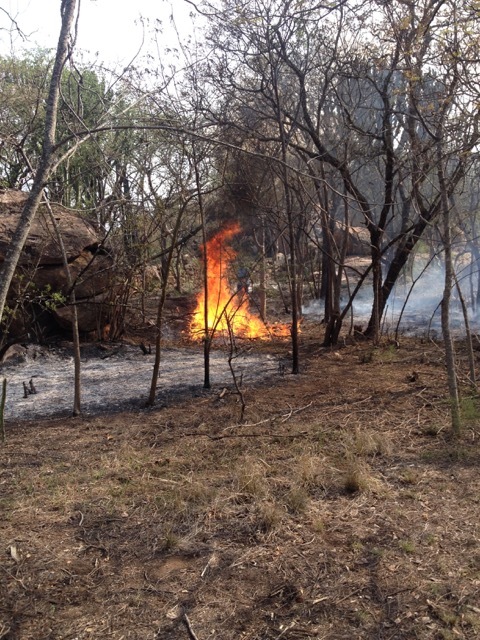 Burning of the cut vegetation was stopped when it was so hot as there was the problem of run-away fires. This decision was agreed by the Bulawayo Fire Department. The areas that were burnt look good. Some trees a little scorched but a great improvement and they will recover. The good news is that the cochineal bug is taking out the prickly pear through natural destruction. Identify and map out any sites of archaeological and historical importance. 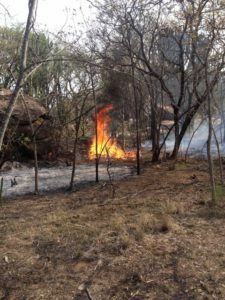 This year the focus has largely been on the clearing and restoration of the natural conditions of Mabukuwene but the future of the property have to be addressed. As the NTZ does not have an income from this particular property and no accumulated funds there was a need to design a joint management plan and project proposal. Here are some excerpts from the proposal that was very kindly compiled by Mr Rob Burrett about developing a heritage centre at Mabukuwene for Bulawayo schools. A concept paper was compiled entitled ‘Mabukuwene Cultural Village’. Mabukuwene lies in southern Bulawayo bounded by the suburbs of Hillside and Burnside. It is an area of great natural beauty as well as important historical associations. Owned by the NTZ since 1979 when it was donated to the Trust by the Thomas Meikle Trust it has sadly been neglected over the last 15 years and has become a place of crime and unacceptable behaviour by members of the public. 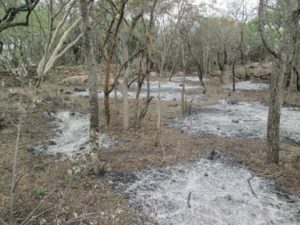 There has also been a very serious invasion by Lantana camara which has developed into a veritable forest to the exclusion of the natural species and limiting access to large parts of the property or any possibility of considering any further development and maintenance of the property. 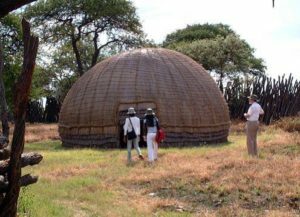 The Zimbabwe Ministry of Education requires that all pupils are exposed to their traditional heritage and a directive requires all schools to construct an authentic “culture house” on the school property. We understand that this requirement is generally not met by most schools. While the concept and its operations have not been fully clarified, we believe that this education requirement creates an ideal opportunity for the NTZ to develop a general small “Cultural Village” facility on Mabukuwene to allow schools to comply to Ministry requirements. 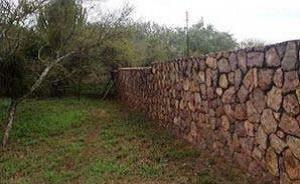 By having a single centre, the life-ways of several different indigenous communities of Matabeleland can be presented. In this way we are achieving possibly more than the Ministry may have intended. It is also a cost effective means of a large number of local schools being able to comply with the Ministry requirements. The centre will be built not only with a focus on schools, but to appeal also to general visitors and tourists. The concept note suggests a way forward that will allow the NTZ to reclaim this property as a place of natural and cultural interest, as well as steps to re-engage other stakeholders such as the Meikles family as well as local residents and the general public. The project requires an initial input of funds then once the future operations are operational they will ensure financial independence and sustainability of this NTZ property. Each of these units will include typical houses, kitchen area and auxiliary structures such as grain bins/baskets. It is also proposed that simple furnace structure be built to show the technology used. Construction will use authentic materials – grass, clay and poles with cement added to the dhaka mixture to extend the lifespan of the structures. Some modern material will be used such as nails and twine. 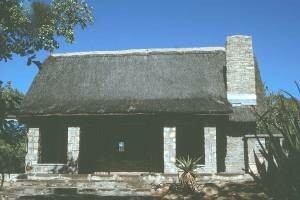 Typical Ndebele homestead building in its original form from koBulawayo. Going forward, we truly hope that we will have the resources and secured the funds to translate the concept paper into a reality. This property has suffered over the years from a lack of attention, due to there being a minimal number of NTZ members living in Bulawayo and the lack of funding. However, thanks to Mr Rob Burrett, with a small team, he commenced the extensive clean up of the site that had become over grown with invasive weeds such as Lantana camara. Mr Burrett also prepared a concept paper outlining a vision to develop a small cultural/educational facility on the site. Funding is now being sought for this facility which will greatly enhance the education of the Bulawayo school children as well as from the surrounding area.